Teledyne Instruments Quick Stem Sensor (QSS) offers an alternative means by which to measure thrust and torque on motor-operated and air-operated valves. The QSS is a pre-fabricated thrust and torque strain bridge that is applied to a shaft in much the same way as a strain gage. This time-saving device was developed to reduce the time and effort required to install strain gages in a radioactive environment. Since its introduction in nuclear plants, the patented QSS has become popular in many other industries and applications where gaging time and cost is a concern. 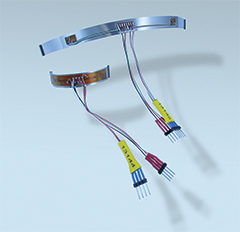 The QSS has strain gages, circuitry, and pre-wired connectors, all installed on a thin stainless steel backing, which is then adhered to the shaft. The QSS can be used with or without calibration, depending on accuracy requirements. For greater accuracy, the transducer can be calibrated for torque and thrust using QUIKLOOK 3.